I am a very fortunate woman. I have been married to my lovely husband for 28 years and we have 4 wonderful children. We have had some ups and some very down downs – as most people have in life…but as I have got older and life has become a little less hectic (with the children now adults) – I have had the opportunity to reflect…and I have decided that my children are amazing people…I am so proud to ‘claim’ them as mine… They are all so very different to each other and each have their own strengths…but they have all been blessed with a good (albeit occasionally rather weird) sense of humour and a pretty balanced outlook on life. As we struggled to bring up four children I don’t think we ever once thought that one day they would be ‘real people’…independent and strong adults…but they are now and an absolute joy to be with! We only have our two youngest still living at home with us and rarely a days goes by without laughter in our house – and very few cross words. Occasionally my husband and I look at each other with amazement and disbelief at the thoroughly laid back attitude our sons have – yet still they seem to be able to get done what needs to be done – perhaps they can teach us a thing or two!! 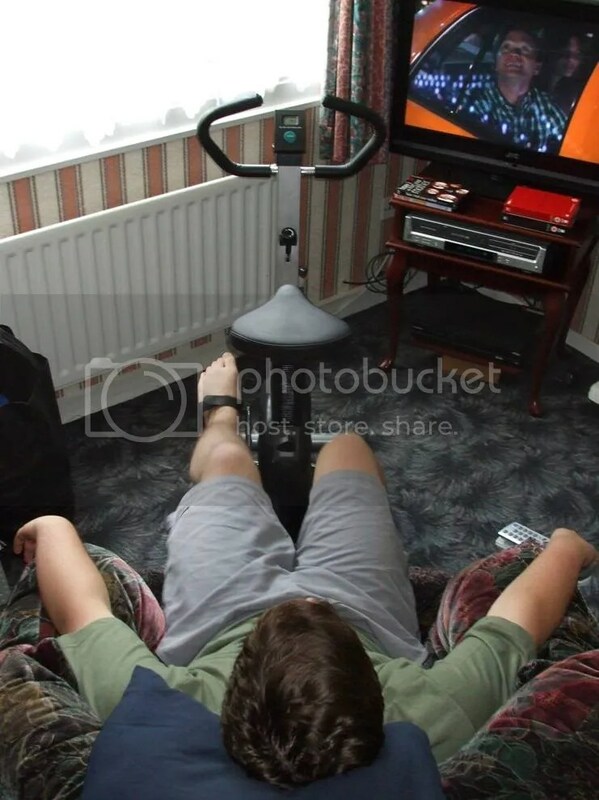 I recently caught my son ‘burning some calories’ on his exercise bike – which he had brought downstairs into the lounge…. and although I was bursting to laugh at the vision I saw – I just had to photograph him first!! As a person – I know I need to learn to relax a bit more – or ‘chill’ as my sons would say – but really….could I ever ask for a better teacher??! !